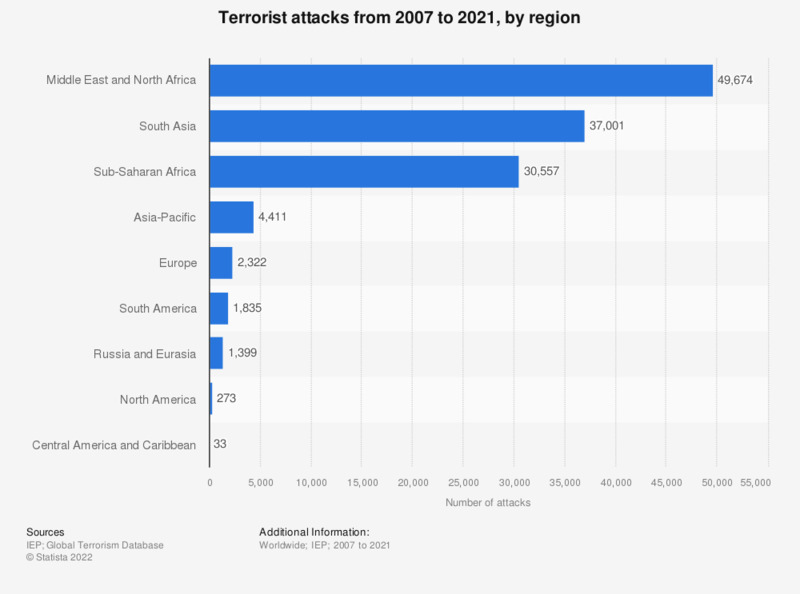 The statistic shows the number of terrorist attacks from 2002 to 2017, by region. In that timeframe, South Asia suffered from 31,959 terrorist attacks. The distribution of terrorist attacks reflects the broad threat terrorism poses globally in the 21st Century. Although terrorist organizations that have their genesis in the Middle East and North Africa hold prominence in the media reports of developed countries, groups such as Al Qaeda, the Taliban and Islamic State do not constitute the whole of international terrorism. South Asian countries, particularly India and Pakistan, have fallen victim to terrorist violence in recent years. Moreover, many groups outside the Middle East have formed coalitions with or aligned themselves to organizations such as the Taliban. Examples include the Moro Islamic Liberation Front in the Philippines and Tehrik-i-Taliban in Pakistan. However, the motivations of terrorist attacks stretch beyond establishing a caliphate or jihad. Ethno-nationalist terrorism is also a prominent issue alongside radical political terrorism such as Maoist attacks in India. Debate still exists over the labeling of certain groups fighting for political or religious reasons as terrorist organizations. This debate is reflected in the Kurdistan Workers’ Party, also known as the PKK, who operate in Iraq and Turkey are considered a terrorist group by NATO and the European Union, but not the United Nations and states such as China and Switzerland.